Tirupati, May 29: In all the Sri Vaishnavaite temples especially those under the umbrella of TTD, the fifth day evening happens to be the most important day during brahmotsavams, as it is much awaited by scores of pilgrims to witness the Grandeur of Lord in all His splendour on the mighty Golden Garuda Vahana which offers a pleasant and rich feast to the tens of thousands of eyes. 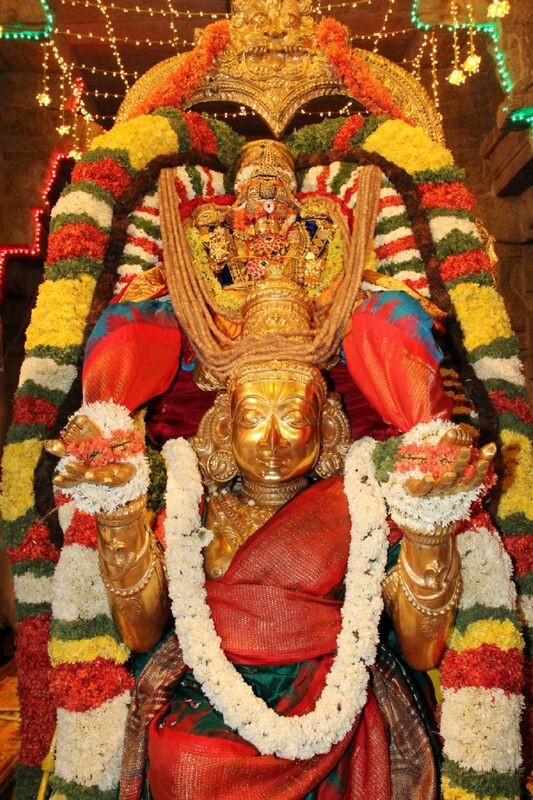 On Friday evening, similar episode took place when Lord Sri Govinda Raja Swamy draped in silk clothes and dazzling jewels seated majestically on mighty Suparna took a pride pleasure ride along the mada streets of Tirupati encircling the ancient Sri Govinda Raja Swamy temple. Meanwhile among all vahana sevas, Garuda Vahana Seva has a special place in Sri Vaishnavism as the mighty King of Aves is considered to be the most favourite vehicle and servant of Lord Sri Mahavishnu. Garuda Purana and Garudopanishad explains the power of this Bird King. Garuda is often depicted as having a shiny, golden body, red wings, white face, a sharp beak and human body. He is a powerful creature, full of energy and a size big enough to block the Sun God Himself! Hence Garuda who is also known by many other names Syena, Gaganeshvara, Chirada, Khageshvara, Kashyapi, Kamayusha, Sitanana, Sudhahara, Nagantaka, Tarkshya, Suparna, Vishnuratha, Vainateya and so on is given a most prominent place in Hindu Mythology. Meanwhile in the evening the shobha yatra of "Padalu"(celestial feet) and Rubies studded Pathakams took place in connection with Garuda Seva of Sri GT. Earlier the procession of Srivari Padalu started from Komalamma Satram near Alipiri and reached the temple while the procession of special jewels-"Erra Ralla Pathakalu" gifted from Tirumala temple reached the temple from Sri Prasannanjaneya Swamy temple located opposite Sri GT. The traditional art forms by dance troupes before Garuda Vahanam stood as a special attraction during the mega religious fete. TTD EO Dr D Samba Siva Rao, JEO Sri P Bhaskar, temple Deputy EO Sri Chandrasekhar Pillai and others took part in the Garuda Seva.